Institute Professor Noam A. Chomsky delivered a critical analysis of America’s “War Against Terrorism” to a packed 26-100, as well as 3 full over-flow rooms. 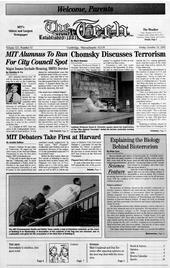 MIT alumnus Steven Jens ’98 will be among the candidates running for a seat on the Cambridge City Council next month. “I was still in shock that we got that far,” Unikowsky said. To reach the tournament’s finals, held on October 6, the team had to overcome Princeton University’s A and B teams in the quarterfinal and semifinal rounds, respectively. In both cases, “MIT Flippant” (Unikowsky and Nichols) won by a unanimous decision of the judges, 3-0 in the quarterfinal round and 5-0 in semifinal round. A joint Undergraduate Association/ Graduate Student Council judicial board will hear The Tech’s appeal of the Association of Student Activities’ decision to revoke part of The Tech’s office space. Recent threats and rumors of bioterrorism on American institutions have set many members of the public and the media on edge. Still, even with all the focus, most are left with burning questions about the “mysterious white powder” people have found on envelopes, and what scientists are doing about it.